"The concepts presented in Interactive Stories and Video Game Art remind me of Joseph Campbell's powerful demonstration of a universal storytelling structure. Coming from a technical game design background yet being artistically inclined, I never considered that atomic elements such as shapes, lines of movement and transitions contain a vocabulary strong enough to sculpt our mood, whether consciously or unconsciously. This book creates that wonderful feeling of learning new letters, which soon prove useful to form new sentences for bringing new poetry to the world." "Interactive Stories and Video Game Art is a great game design resource, as it breaks down shape theory in all aspects of design." 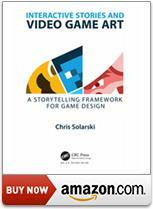 "The clever thing about this book is that it bridges the worlds of game design and storytelling. I would recommend this to anyone who wants to get into game design and understand what's going on beneath the surface. It reminds me of Robert McKee's Story, the classic book on screenwriting. You read it and you think: Aha, this is how storytelling works in film, it really can be explained! 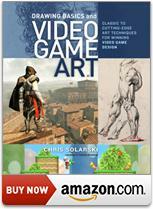 And you can see this book as a companion volume that is essentially doing the same thing for games." "Chris Solarski's book is extremely ambitious; from the smallest detail to broad concepts that encompass an immense scale, its truly applied methodology serves as a catalyst that enriches the reader's heart and promotes the creation of pure art." "Interactive Stories and Video Game Art touches upon factors that can be a barrier to the developers’ experience being actualised: managing player attention, dealing with memory, communicating how players should think about playing, in addition to the practicalities of play. I feel I have a more robust means of assessing the experience developers are aiming to achieve as a result of these guidelines. The contractual nature of my work also means that I’m tasked with quickly communicating the design intent between the dev team and my team. The visual communication symbols presented in each chapter are sure to play a part in that process moving forward." "As a game designer, I think Interactive Stories and Video Game Art is a must-read. I love how Chris Solarski puts game design and gameplay at the centre of the whole artistic process, so everything is easily applicable to any project and to both sides of development, to game design and graphics." "As a gamification designer you look for inspiration from multiple sources to create behavior-change and evoke emotions that help your audience make decisions. Chris Solarski captures brilliantly how dynamic composition techniques for transmedia storytelling can assist in reaching your audience through shapes, flow, positioning and much more." ―An Coppens, Chief Game Changer at Gamification Nation Ltd.
"This book is an eye-opener. I haven't been in the games loop for a while, but it transcends games. Reading it made me feel what I felt when I first studied cinematography." The success of storytelling in games depends on the entire development team―game and narrative designers, artists, writers, programmers and musicians, etc.―working harmoniously towards a singular artistic vision that centres around the player. Interactive Stories and Video Game Art (CRC Press 2016) defines gaming's equivalent to cinematography—presenting a common design language for understanding how game design and game art affects the user's emotional and physical experience. The proposed framework inherits the rich history of art and craftsmanship that games build upon, which includes classical painting and sculpture, theatre, performing arts, film and animation as well as psychology. Case studies of hit games like The Last of Us, Journey, and Minecraft illustrate the vital components needed to create emotionally-rich stories that are mindful of gaming’s principal relationship between player actions and video game aesthetics. This book is for developers of video games and virtual reality, filmmakers, game user research, gamification and transmedia experts, and everybody else interested in experiencing resonant and meaningful interactive stories. For bulk orders and academic discounts of Interactive Stories and Video Game Art please contact specialsales@taylorandfrancis.com (North and South America) or cis@tandf.co.uk (rest of world). "This book supports my 30-year crusade to demonstrate that games are an art form that undeniably rivals traditional arts. It gives detailed explanations of game art techniques and their importance while also highlighting their dependence on artistic aspects of game design and programming"
"Solarski's methodology here is to show us the artistic techniques that every artist should know, and then he transposes them to the realm of video games to show how they should be used to create a far more artful gaming experience ... if I were an artist planning to do video game work, I'd have a copy of this on my shelf." Drawing Basics and Video Game Art (Watson-Guptill 2012) is first to examine the connections between classical art and video games, enabling developers to create more expressive and varied emotional experiences in games. Artist game designer Chris Solarski gives readers a comprehensive introduction to basic and advanced drawing and design skills, light, value, color, anatomy, concept development as well as detailed instruction for using these methods to design complex characters, worlds, and gameplay experiences. Artwork by the likes of Michelangelo, Titian, and Rubens are studied alongside AAA games like BioShock, Journey, the Mario series, and Portal 2, to demonstrate perpetual theories of depth, composition, movement, artistic anatomy, and expression. Although Drawing Basics and Video Game Art is primarily a practical reference for artists and designers working in the video games industry, it's equally accessible for those interested to learn about gaming's future, and potential as an artistic medium. The book has been translated into Japanese and Korean. For bulk orders and academic discounts of Drawings Basics and Video Game Art please contact [email protected] For academic needs and to order desk/exam copies please visit www.randomhouseacademic.com.